2.6" x 5.5" stitched on 14 count. 2.1" x 4.3" stitched on 18 count. 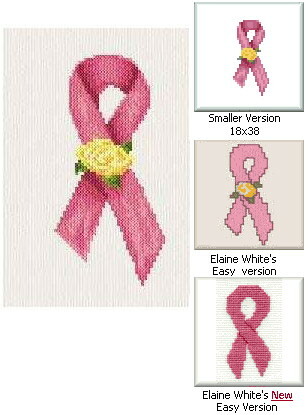 Breast Cancer Awareness cross stitch pattern... October is breast cancer awarness month. Also includes a smaller design plus 2 smaller patterns designed by Elaine White while she was in hospital for treatment.